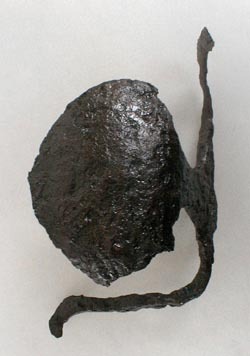 Shell Guard (mid-17th century): Present only on the outboard side, this guard would have been mounted on an English hanger, a short sword used by infantrymen to supplement their muskets for close fighting. Fragments of these guards are commonly found on 17th-century Virginia sites. This one comes from Jordan’s Journey near Hopewell in Prince George County.